A domain name is the URL used to identify your website, such as www.yourbusiness.com; it generally costs $0 to $14 per year. 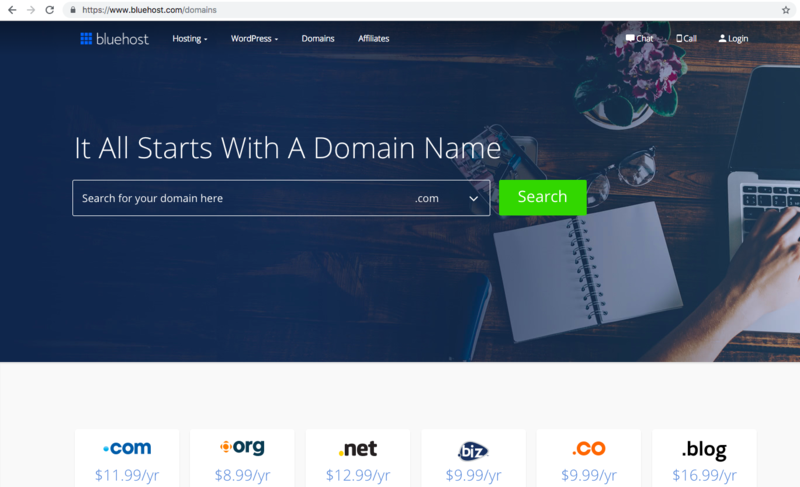 Here’s how to register a domain name: visit a domain registry, search for your desired domain name, and follow the checkout prompts. Finally, connect your domain name to your website. Before registering a domain name, create a list of five to 10 of your desired domain names and order them from most desirable to least desirable. 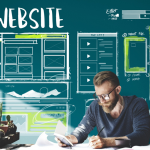 As you create your domain name variations, consider including your business name, adding industry-specific keywords, and using a .com extension. Start with your business name – See if your business name is available as your domain. If not, consider variations that might suffice. For example, if www.johnshotdogs.com is unavailable, consider something like www.johnsdogs.com. Research relevant keywords – Use a keyword tool such as Wordtracker or Ubersuggest to find keywords with high search volume that relate to your business. If your business name isn’t available, consider adding a keyword to your domain to make it unique. Using the example above, this might look like www.johnsgermanhotdogs.com. Use a location signifier – For businesses with mostly local clientele, using a city or state abbreviation as part of a domain name can be useful for customers searching for your products/services in a particular area. For instance, consider something like www.johnshotdogsnyc.com. Choose a .com extension – A domain extension is what appears after the main part of your domain (www.yourbusiness.com). There are a number of extensions you can choose from, but businesses should strongly consider choosing .com over .net or other extensions like .org to give your business a more professional online presence. Once you have compiled your list, keep it handy for domain name registration. If you are still unsure and need more assistance before registering a domain name, read our article on domain name ideas from industry professionals. Now that you have your list of top domain names, you’re ready to register one of them. You can do this one of two ways. Either register your domain without web hosting by navigating to a registrar like Bluehost and clicking on “Domains,” then finding and selecting your domain name. Or, use the widget below to find your domain and secure it for free by signing up for web hosting. Free domain names are often available as part of web hosting packages. If you’re interested in this option, enter your desired domain name (as determined in step one) in the search field below to see if it is available. If it is, you will be taken straight to a registration page. If not, then you’ll see a message that says the domain is not available for registration and you will need to try other variations. After inputting your desired domain name above and receiving a notification that it is available, click “next” to begin the process of registering your new domain and purchasing a web hosting plan. The following screen will prompt you to enter all of your new account information, including address, contact information, and payment details. First, enter your account information (name and address). Further down the screen, you will be various web hosting package options. 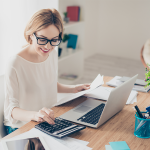 If you’re not sure which package is right for you, you can navigate to Bluehost in a separate browser window to compare plans. Select the plan and contract length that are right for your business needs from the dropdown menu. Below the plan options, you will see checkboxes for various plan extras. Click on “more information” below each to learn about them, though we highly recommend you at least choose Domain Privacy Protection—this keeps your account information hidden from public databases, which reduces spam. 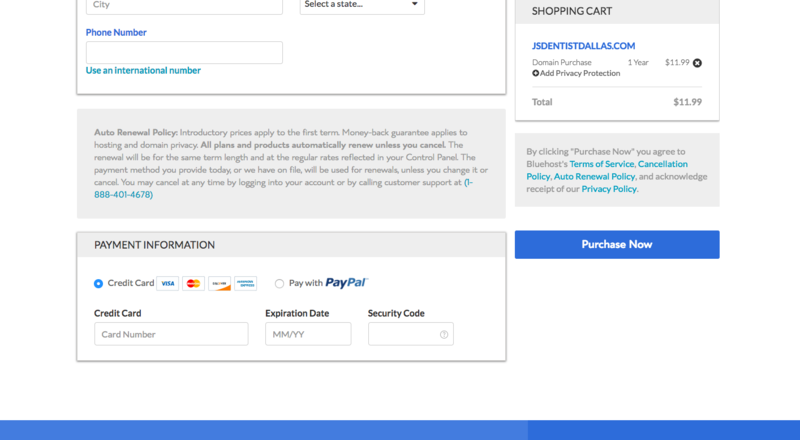 Scroll a bit further down the page and enter payment information using a credit card. Click the checkbox at the bottom, and click the “Submit” button to complete your purchase. After completing your purchase you will be brought to the Bluehost dashboard. From here, you can connect your domain and manage your web hosting plan. Click the “domains” tab at from the menu to see your new domain name. 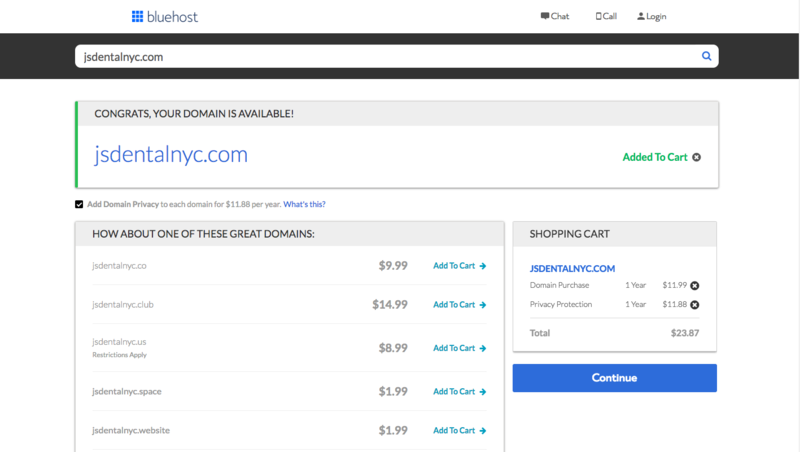 If you don’t need hosting and only want a domain name, navigate to Bluehost.com and click on the “Domains” option from the menu at the top of the page. On the following page, enter the top domain name from the list you created in step one to see if it is available. If your desired domain name is available, you will be brought to a page that says, “Congrats your domain is available” with the option to “Continue” to checkout. If your desired domain name is not available, you will get a message notifying you of this, along with variations that are available. Either select an available variation or input another domain from your list at the top of the page to see if it is available instead. 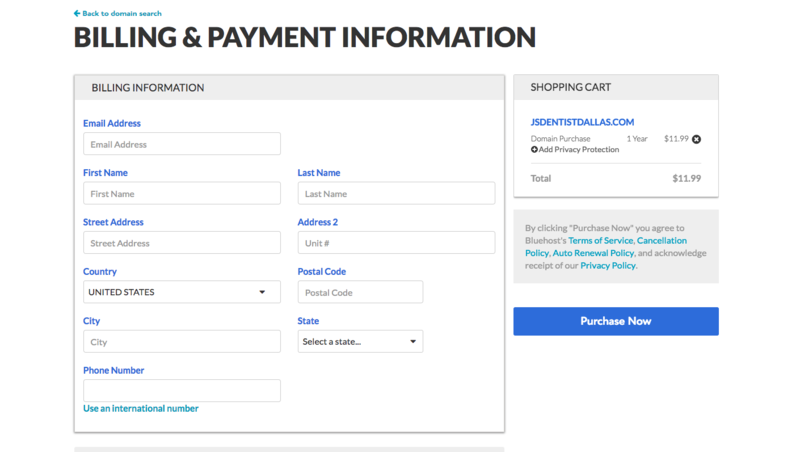 Before clicking the “Continue” button to begin the checkout process, notice that your shopping cart automatically adds “Privacy Protection” for an additional $11.88 per year. 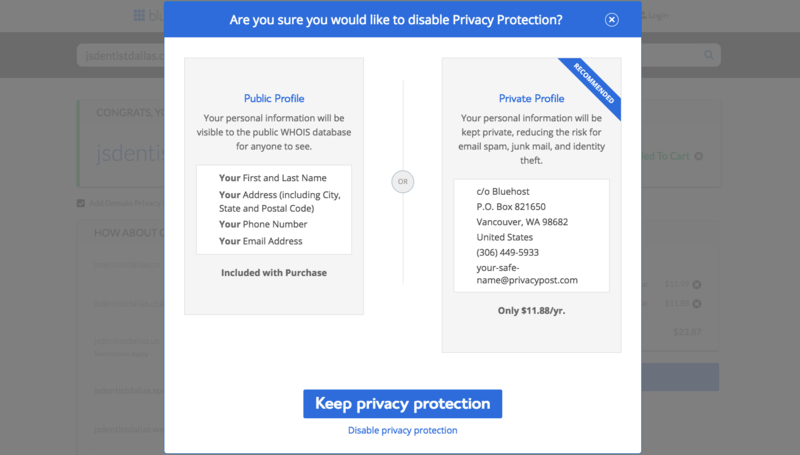 This will register your domain name privately, so that your registration information displays Bluehost’s information instead of your own—an effective way of protecting you against spam. Click the delete icon to the right to remove it from your cart and to learn more about private domain registration. After clicking continue, you will be brought to the checkout page. First, enter your address and contact information. Keep in mind that if you do not register your domain privately, this information will be displayed publicly in the domain name lookup tool, WHOIS. Scroll down to enter your payment information. Here you can choose between paying via credit card or paying with PayPal. Complete the form and click the “Purchase Now” button to the right to finalize your domain name registration. After you have registered your domain name, you will want to link it to your business website. 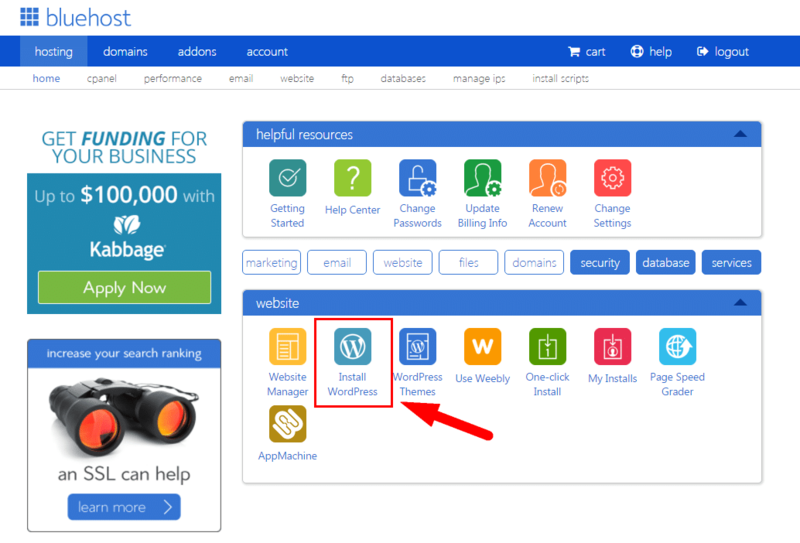 For those who purchased a Bluehost web hosting plan and are using the WordPress content management system (CMS) to build their site, simply use the one-click installer from the user dashboard as illustrated below. This will automatically connect your domain to your website and install WordPress. Those who purchased the domain name only will need to manually connect their domain to their website. This is done by adding your unique nameserver information to your website. To connect your domain name to your hosting accounts and install WordPress, domain mapping is required. To do this, follow the steps outlined by WordPress. While we recommend Bluehost for its price and ease of use, there are a number of different domain name registrars. Each of the options below varies based on cost and additional features, such as web hosting and email. Make sure you consider your business needs before choosing the right domain name registrar. GoDaddy – If you are purchasing a domain and do not need a website or web hosting, GoDaddy is an ideal domain name registrar. Pricing for a single domain starts at $11.99 per year and $2.99 for two years. Namecheap – Namecheap offers domain name registration for as little as $8.88/year/domain. Weebly – Get a free domain name and a website for just $5 per month on Weebly’s Connect plan. Weebly uses a drag-and-drop interface, making it very easy for anyone without web design experience to build a site. Wix – Domain names are included for free on Wix’s premium plans, which start at just $11 per month. Plus, their drag-and-drop interface makes it easy to build a website without any coding knowledge. Google Domains – Registering a domain name with Google is very simple and the cost starts at $12 per year. Registration also includes domain name registration privacy at no additional cost. The best domain name registrar will depend on your business needs. Those who need web hosting will find Bluehost’s cheap plans with free domain name registration to be the best option, whereas those who only need a domain name at a low price will find registrars such as GoDaddy and Namecheap to be better options. While finding a truly free domain name is difficult, it is possible to get a free domain as part of a web hosting package. 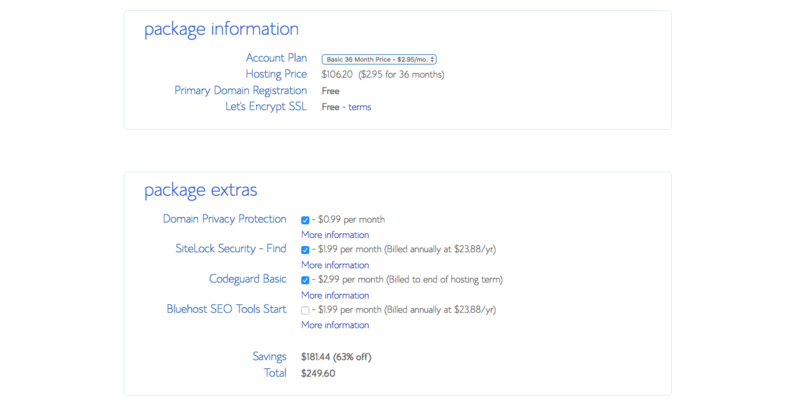 For example, when you buy web hosting from Bluehost for $2.95/month, you also get one free domain name. 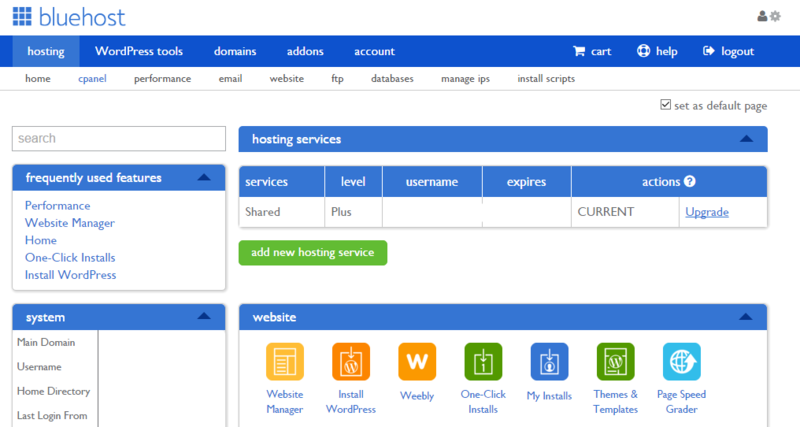 Other hosting sites, like Weebly, also offer free domains with hosting packages. 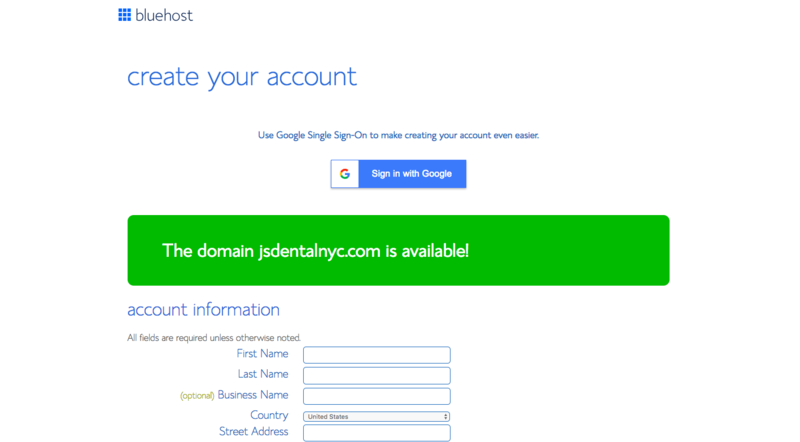 Get step-by-step details on how to get a free domain name. If you’re registering a domain name, you will likely see ICANN (Internet Corporation for Assigned Names and Numbers) mentioned in the registration process. It is a non-profit organization that manages all namespaces (domain names), serving as an online database of domain names. In the domain name registration process, you will have the option to register your domain name privately for an additional fee. With domain privacy, the contact information used to register the domain is not publicly available through WHOIS, a database of domain registration information. The reason some choose domain privacy is to avoid unwanted solicitations and spam. What Are the Best Domain Name Registrars? When register a domain, the registrars that are typically regarded are the best include GoDaddy, Google Domains, Bluehost, and Namecheap. Ultimately, they all offer similar services, though which is best depends on what you’re looking for. For example, Google Domains cost a flat fee of $12 per year and includes domain privacy, whereas GoDaddy offers domain names for as little as $2.99 per year for two-year registrations. Get the full breakdown of the best domain name registrars. Can I Use My Domain Name as My Email Address? Yes, getting a domain name is your first step to creating professional email addresses that use your own domain name. Setting up your custom email address will depend on which email platform you wish to use, such as Gmail, Outlook, or Apple Mail. It will also depend on where you purchased your domain name. Get a step-by-step guide on how to set up a free business email address. Businesses need a domain name, such as www.yourbusiness.com, if they are going to have a professional online presence. Register your domain name in a couple minutes by researching potential domain names, going to a domain name registrar or web host such as Bluehost or GoDaddy, searching for your desired domain name, and completing the checkout process. The best way to get a domain name for free is by signing up for a Bluehost web hosting plan. Not only are plans affordable at just $2.95 per month, they include free email, site security, and more. Bluehost also makes it very easy to connect your domain to your site. Get your free domain today by signing up for hosting.